In today’s fast-paced world, the biggest consideration when choosing a home is location. When you must pack so much into 24 hours, you have no desire to while away chunks of time in bumper-to- bumper traffic or on long commutes! The ideal neighbourhood, in the minds of most couples, is one that has trouble-free neighbours and building society, is well-connected, is fairly close to both of their workplaces, and has proximity to a good school, access to proper medical care, and a few nice places for relaxed evenings out in the vicinity. Unfortunately, it’s very difficult to reach your ideals, and so most people compromise, subjecting themselves to long commutes with little chance to de-stress. With workplaces moving to the suburbs or to SEZ zones, most people who earlier were considered to live ‘centrally’ are finding themselves in this boat. With the vast majority of Chennai’s IT companies situated along the OMR, now dubbed the ‘IT Corridor’, central Chennai dwellers are the ones who find themselves stuck in traffic everyday, with the time lost commuting far outweighing any time saved and weekends mostly spent recuperating. Fortunately, real estate along the OMR is booming, with apartment buildings and residential colonies springing up regularly. Many erstwhile remote suburbs are now residential hubs with close proximity to every convenience and amenity found in the city, including top restaurant chains, malls and movie theatres. 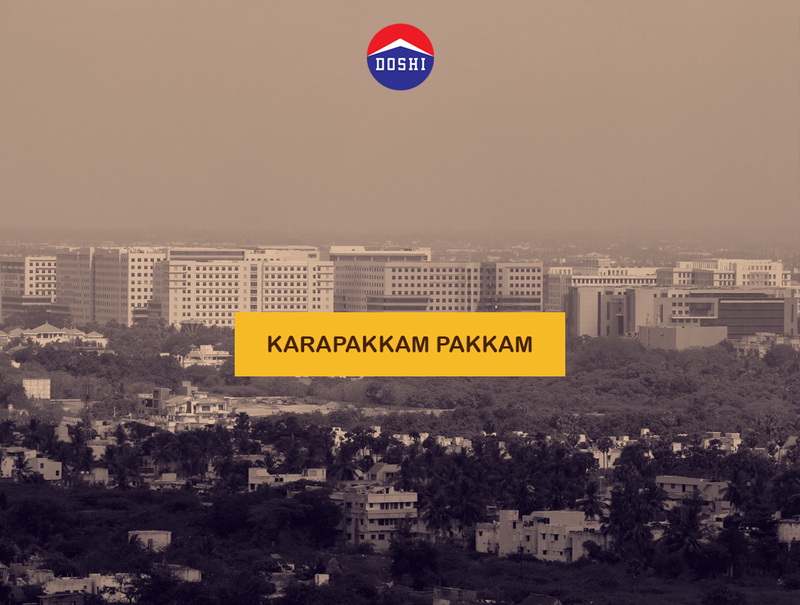 Karapakkam the location of Doshi Housing’s new project, Risington, is one such residential hub. Located roughly at the centre of the IT Corridor, it is an excellent hub for commuting practically anywhere on the OMR via superfast 6-lane highway. The neighbourhood itself boasts an abundance of BPOs and IT/ITES companies, including Tata Consultancy Services, Elcot SEZ, MARG Junction Mall, Sanmar Engineering Technologies, Prestige Cyber Towers, and so on. It is also home to several upcoming real estate projects, including Riverside Mall, as well as several local and international restaurant chains. But what about education and healthcare? Karapakkam also happens to be home to an international school - Hindustan International School, just 3.2 km away from our site. The National Institute of Management Studies, Da Vinci School of Architecture, and KCG College of Technology are also in this zone. Apollo Hospitals, as well, is a feature of the area, at just 2.3 km away! So if you work on the IT Corridor and are sick of commuting, dreaming of the ideal home and waiting for it to come along, you know what to do - move where the action is!